The first time I heard of whey was my third year in the university when discussing single cell proteins (SCP). Of course, it was refered to then as a waste by-product in the production of cheese, but could be used as a substrate for some microorganisms like Lactobacillus, Aspergillus and Saccharomyces in the production of SCP. Those were days of excitement for students when thoughts of revolutionising the Nigerian bitechnology industry were prominent on our minds. Anyway, fast-forwarding the years, whey has really transformed from a less known industrial waste products to a well-adored product coveted by both the nutritionist and the pharmaceutical world, so much that the contagious agitation about its usage is starting to make the same scientists promoting its name to warn people about the potential hazards in its uses and abuses. 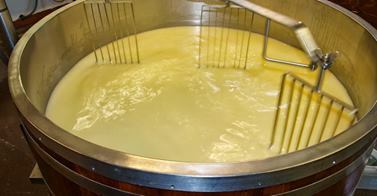 For those who don’t know, whey is a by-product in the production of cheese and other cuddled milk products. It can also be refered to as the liquid remaining after milk has been deproteinised (removal of casein, which is 80% of the milk) and defattened. According to some authorities, whey still contains about 50% of the nutrients present in milk, which include milk sugar (lactose), serum proteins (whey proteins), minerals, little fat and vitamins. Because of these components left even after cuddling of the milk, whey has found many uses and applications. Perhaps, the most prominents of all these is the whey protein, which has been found to contain biological components such as: Lactoferrin, a non-haem, iron-binding glycoprotein with antimicrobial and antioxidant effects; some amino acids such as leucine, isoleucine and valine, which are required for tissue growth and repair; some specific antibodies to E. coli, Salmonella enteriditis, S. typhimurium, Shigella flexerni and human rotovirus; and Lactoperoxidase, which is the most abundant enzyme in whey and has been shown to have anti-bacterial effects against many bacterial species. Due to all these components and perceieved benefits of whey, especially whey protein, it has become a popular dietary protein supplement purported to provide antimicrobial activity, immune modulation, improved muscle strength and body composition, and to prevent cardiovascular disease and osteoporosis. Its effect on the above-listed bacteria was thrown up at a recent seminar attended at the Fedaral University of Technology, Akure, Nigeria. During this seminar, it was propounded by Adewole Awe, a Master’s Degree student majoring in food microbiology, that fermented whey can be used in treating bacillary dysentary caused by Shigella flexerni while also affecting the normal microbiota of the body. This corroborated earlier report by Carol Bayford, a nutrition therapist, in her book Whey Protein: A Functional Food. All the functional components mentioned above are, in J. N. de Wit’s Lecturer’s Handbook on Whey and Whey Products, refered to as minor components. The major component is the sugar, lactose, an important source of energy that also enhances the absorption of calcium from foods in the intestines. And it is also the major source of limitation in the usage of whey and its product. Lactose required the enzyme lactase for its proper utilizatio in the body, so that the ingested lactose can be broken up into usable glucose and galactose which are readily absorbed by the body in the intestine, where absorption of nutrients from foods usually takes place. The problem, as many would know, is that some significant numbers of the population are lactose intolerant. Lactose intolerance people will apparently have undigested lactose in their intestinal tracts, which microorganisms in our body would feed on, leading to production of gas and lactic acid and eventually resulting into flatulence, abdominal cramp and diarrhea. However, it has been found out that there are 50grams of lactose in about 1litre of milk, and that it would require the same exact amount of water to stem this reaction. Also, most lacotose intolerant individual has been found out to be able to withsatnd at least 12grams of lactose, which is present in about 250ml of milk or yoghurt. All in all, whey and its products have found themselves important in indutrial set-ups, finding useful application in dairy products (ice cream and yoghurt), confectioneries ( candy and chocolate), bakery products (bread, biscuits and cakes), meat/fish products ( ham, soups and sauces), dietic, slimming and clinical foods, nutritional drugs (tablets and inhalers), nutraceuticals (probiotics and prebiotics), and even infant formula. Perhaps, the most interesting one is its purported positive actions in the treatments of cancer, hepatitis, HIV, cardiovascular diseases, obesity, osteoporosis and infantile colic. These has led to intense researches over in recent years and drawn both appraisal and criticsm alike. This is because, while whey is a cheap raw product useful in all ramifications mentioned above, its effectiveness lies in those components present in it, which some critics claim could be gotten from other sources. While this article is an eye-opener to the potential importance of whey in our country, there still exist a technological vaccum in the country that needs to be filled. Over the coming months, the magazine would be examining how whey are, and can be, used to produce and develop all products listed in the preceeding paragraphs, and how it can be harmlessly incorporated into our everyday lives. Care must be taken, however, about its usage because of the potential hazards that could be present. Stay healthy.